As a member of The Old Schoolhouse Homeschool Crew, I recently received an Amazing Bible Timeline with World History chart to review. The first thing that struck me when it came in the mail was how HUGE it is (37" by 45" in fact). We unrolled it, and started looking over the colorful chart, and commenting on what we found. This doesn't do it justice, let me say. 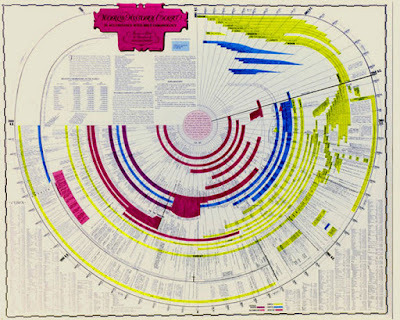 You can see in the picture, though, that this is a colorful chart, jam-packed with information. I love the circular format, and since we are studying Ancient History right now, we are able to make pretty extensive use of the beginning parts of this chart. Okay, so let me try to explain it. Time begins at the center on top. The yellow represents Shem's line (and his ancestors). The blue at the beginning represents Cain's descendants. The dark line at about 2:00 is the flood. From there, blue represents Ham and his descendants. The dark pink represents Japheth's line. There is some other color coding too, to differentiate Reformation (light pink) and Roman Catholic (purple-y). The timeline is split up geographically as well. The innermost dark pink circle is all about China, the next one out is Japan. Other lines include Greece, Rome, Persia, Egypt, Phoenicia, the Americas (the outermost yellow circle), and so on. They acknowledge up front that some of the dates are open to question, and scholars do not agree. (See here for their explanation of the dates used.) Obviously, with Adam and Noah, this fits in with a young earth perspective. Ushers is a major source of the dating of Biblical events, and while I don't necessarily believe his dates are infallible, they are good enough for the purpose of this (or any) timeline in that it gives you that broad overview... you know, things like David was king around the time that Aeneas was fleeing Troy and heading off to found Alba Longa (the beginnings of Rome. Or that Nebuchadnezzer was in power about the same time as Ninevah was destroyed, Athens was thriving, Cyrus was reigning in Persia, Buddha was such an influence in India, and Confucius was about to be born. My response to the timeline: We are loving it for studying ancient history. I'm not so sure that I'll like it nearly as much as we get further along though. The format of the timeline is really to integrate Biblical history with world history. As a result, the amount of space dedicated to more current events is fairly small. That is really nice for gaining some perspective on how small a portion of time the US has existed. But it necessarily leaves out a lot of detail. And some of their choices as to what to include are a bit strange. Of the thirteen events included for the Americas during the 1800's, Brigham Young leading Mormon pioneers to Utah is included; Lewis & Clark and/or the Louisiana Purchase, or any other western migration for that matter, is not. I love having this timeline though. It is adding so much to our studies, and we are having fun looking it over and making connections. We will use it for our studies this year and probably next (next year will be roughly AD 30 through 1456) and then we will rely on other sources. You can check this out for yourself, and see the freebies that come with it, at their website. $30 for one ($50 for two) also includes a couple free downloads with maps and a digital version of the timeline. Disclaimer: As part of the TOS Homeschool Review Crew, I did receive this Timeline and the downloads for free from the vendor in question. The fact that I received a complimentary product does not guarantee a favorable review. It does guarantee a review. A fair review. But I am not going to praise something unless I think it deserves the praise. If I don't like it, you'll hear that. And hopefully with enough detail as to why so you can decide for yourself if what I hate about it makes it perfect for your family. For more about my take on reviews, visit my blog post here. I noticed that according to the timeline Christianity is directly associated with Catholisism. So if you are a Catholic this Bible Timeline will satisfy you.